At this year‘s Techtextil exhibition in Frankfurt am Main the Sandler booth was a veritable magnet for about 600 visitors from the nonwovens industry, industry and politics. The nonwovens manufacturer from Schwarzenbach a. d. Saale, Germany welcomed the audience to the „textile building“ for a mini-break in the world of nonwovens—a model home encompassing a showroom and a meeting room, complete with a terrace and garden. Visitors were offered a first-hand look at the diverse areas of applications for Sandler nonwovens and a chance to be inspired by the fascination with nonwovens. The Sandler mansion highlighted applications in construction, making them the main talking point at the Sandler booth and beyond. In walls and roof, nonwovens of the fibercomfort product family created well-tempered rooms and pleasantly quiet conversational acoustics despite the bustle of activity at the booth. In the showroom the nonwovens proved their functionality in a drywall for individual room design and as pipe insulation that adjusts flexibly, perfectly insulating even bends. 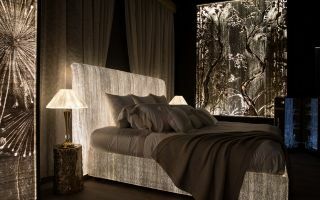 fibercomfort nonwovens insulate heat and sound. The textile materials were also sought after for application in office acoustics and interior design, winning over the professional audience with excellent sound absorption and easy processing. A cycle of reusable materials placed special emphasis on recycling and sustainability, demonstrating how fibercomfort nonwovens set standards in this area as well. Made from 100% polyester, they contain recycled raw material and are easily recyclable themselves, even after years of use. Owing to these properties, visitors even compared fibercomfort insulation nonwovens with materials made from natural fibres such as wood or flax with regard to their sustainability. Nonwoven diversity In the garden, sample collections showcased a wide product range for the automotive industry, filtration, construction, technical insulation, hygiene products and wipes. 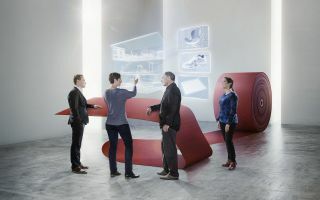 Visitors from the automotive industry were particularly interested in Sandler’s lightweight, recyclable absorber nonwovens for interior and exterior applications, nonwovens for moulded parts and upholstery nonwovens for comfortable seating. Synthetic nonwovens for climate filtration, that provide indoor air quality by keeping the air clean; as well as nonwovens for air and liquid filtration in the automobile were also in demand. 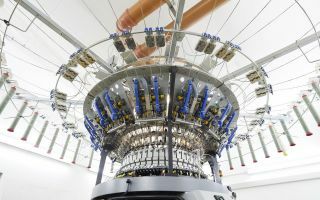 Techtextil exhibition focusses on technical applications. Nevertheless, representatives from all of Sandler’s markets visited the booth. Customers and potential clients from the hygiene industry were impressed by the softness and functionality of Sandler hygiene nonwovens and by the manifold design opportunities through printing and embossing. Even companies from the home textiles market, for example a manufacturer of mattresses and bedding, sought talks with the Sandler team. Design & Innovation Sandler’s singular booth design also attracted a large number of visitors who had not had any experience with nonwovens before and now discovered the fascination with nonwovens. Apart from the practical applications featured inside the house, highlights in product design and processing were showcased on the terrace, demonstrating the unique versatility of nonwovens: A wide-brimmed hat made of nonwoven, which, upon closer examination turned out to be a lampshade; sample nonwovens equipped with different embossing designs, print motifs, or laminated with coloured fabric, which open up individual design opportunities; and composite materials incorporating nonwovens, which exploit new areas of application. Nonwoven-carbon composites, for example, demonstrated how extremely light materials can offer a high degree of stability. Textile companies, processors, engineers and even designers alike were fascinated by these unique exhibits. 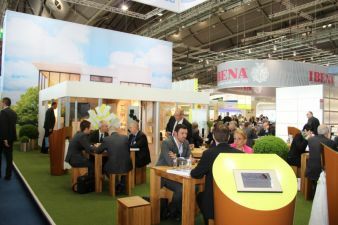 From university students to members of parliament During the exhibition, which premiered a duration of four days, Sandler’s partners from all sales markets did not want to miss the new booth design. Customers, suppliers and potential clients informed themselves about latest developments. The Sandler staff from sales, product development, purchasing and marketing welcomed visitors from Germany, other European countries, the US as well as Asia to discuss ideas on current projects and innovations. The team established promising new contacts and many talks brought ideas and plans for new developments. On the second day, Dr. Ulrich Hornfeck, Member of the Management Board, and Gerhard Klier, Sales Director Technical Products, introduced some of the textile industry’s young professionals to the world of nonwovens: Students from the Technical University of Dresden visited the Sandler booth and were impressed by the wide range of applications, interviewing the Sandler team on the diverse processing methods available. Local and federal politicians also sought the active exchange with companies on occasion of the international trade fair: Brigitte Zypries, Member of the German Parliament and Parliamentary State Secretary at the Federal Ministry for Economic Affairs and Energy, was given in-depth information on nonwovens by CEO Dr. Christian Heinrich Sandler and Dr. Ulrich Hornfeck. Franz Josef Pschierer, State Secretary in the Bavarian Ministry of Economic Affairs and Media, Energy and Technology, also familiarised himself with nonwovens at the Sandler booth. 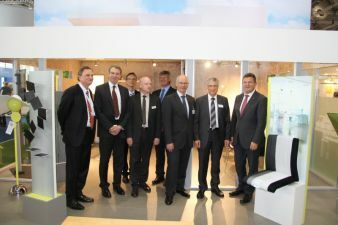 During a tour of the exhibition, organised by the Association of the Bavarian Textile and Apparel Industry, Dr. Oliver Bär, District Administrator of Hof; Dr. Karl Döhler, District Administrator of Wunsiedel; Hans-Peter Baumann, Mayor of the town of Schwarzenbach and Deputy District Administrator of Hof, visited the Sandler booth together with Dr. Christian Heinrich Sandler, President of the Association of the Bavarian Textile and Apparel Industry. On the last day of the fair, Ingeborg Neumann, President of the Confederation of the German Textile and Fashion Industry also paid a visit to the Sandler Garden and Mansion. The unique booth design equally attracted numerous representatives of local and international press throughout the duration of the trade fair and Board Member Dr. Hornfeck gave interviews to editors from television as well as print media at the Sandler booth.